Miss Priscilla Verne’s serio-comic effusions were as excellent as of yore, this lady being a deservedly popular performer. Last evening saw another large crowd at the popular open-air entertainment now being given by Messrs. Jones and Lawrence. The star of the combination, beyond all question, is Ouda, who skywards, high up in the air, performs some of the most marvellous feats of daring. When it is said that Ouda has no superior, the famous Silbons notwithstanding, we say simply what is true. His flight through space must be seen to be believed. Miss Priscilla Verne, always a big favourite in the Eastern colonies, has already established her claim to be considered one of the features of this show. The first appearance of Miss Verne, a clever variety artist who has won considerable fame in other colonies, was greeted with enthusiastic applause, which increased as the singer gained grace in the audience. The gem of the evening was her song ‘Waiting for the Verdict,’ in which she appeared in character, and her rendering of ‘Their Heads Nestle Closer Together,’ was very artistic, the last of a number of recalls being responded to by a speech, in which she expressed heartfelt gratitude for her splendid reception. The sister of comedians Joe and Alf Verne, Melbourne-born soubrette Priscilla Verne married minstrel showman Charles Hugo (Hugo’s Buffalo Minstrels) in 1882. After divorcing her husband in 1892 Verne spent much of the next 15 years overseas working as a solo artist and sometimes touring her own company. In 1909 she formed an act with Nat Phillips’ former partner, Tommy Armstrong. 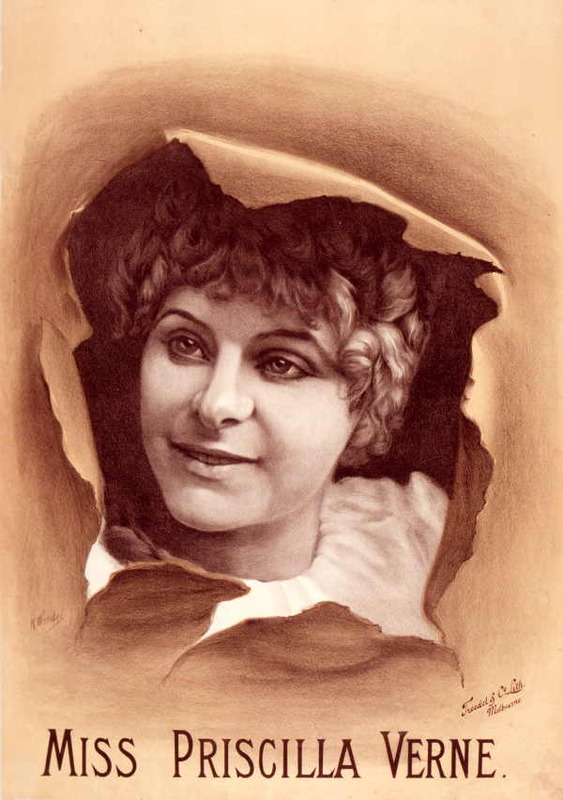 Verne retired from full-time performing in 1912 following her marriage to politician George Black. She appeared in occasional ‘stars of the past’ shows until at least 1943.